A4 Mounted 7.3 x 9.7 in. (186 x 247 mm) 11 x 14 in. Red Tara is known by the name of Rigjay Lhamo (Tib. Rig-byed lha-mo), meaning "The Fully-accomplished Goddess", who manifests as a peaceful emanation of the red subjugating goddess, Kurukulla. She is crowned by Amitabha Buddha, the Lord of the Padma Family, whose red colour represents the transmutation of passion into discriminating wisdom, and the purified desire to liberate all beings from the sufferings of samsara or cyclic existence. The red deities of the Padma or Lotus Family are also associated with the enlightened speech aspect of the Buddha, with the red colour of Amitabha being equated with the red syllable AH of the throat chakra and the faculty of speech. The practice cycle of this aspect of Red Tara (Tib. Drolma Marpo) was originally revealed by Amitabha Buddha, then through Avalokiteshvara and another emanation of Tara on to Nagarjuna and Padmasambhava. Padmasambhava then gave this cycle of teachings to his consort, Yeshe Tsogyal, instructing her to conceal them as a terma or ‘hidden treasure’, which would be discovered at a time when they would be of most benefit to humanity. For over a thousand years these teachings remained hidden, until they were revealed through the mind of a twentieth century Nyingma terton named Apong Terton (1895-1945). Near the end of his life Apong Terton asked one of his monks to find him when he would be seventeen-years-old in his next incarnation and bestow the initiation and oral instructions of this Red Tara terma practice to him again. Apong Terton next incarnated as His Holiness Sakya Trizin (born 1945), but logistically it was quite difficult for this monk to travel from Tibet to Sakya Trizin’s monastery in Dehra Dun, India. However, en route to Dehra Dun the monk happened to pass through the sacred site of Tso Pema, where the Nyingma lama Chagdud Rinpoche was residing. So along with Sakya Trizin and his sister Jetsuma, the oral transmission of this ‘Treasure Cycle of Red Tara’ was also given to Chagdud Tulku Rinpoche, who in the 1980’s then began to teach this practice extensively to his students in California, Oregon, and Brazil. The full-title of this Red Tara cycle is: "The Condensed Essence of the Treasury of Supreme Enlightened Mind: The Mandala Ritual of the Noble Red Tara called the Wish-fulfilling Essence". The cycle includes preliminary practices, dream yoga, generation and completions stage practices, and teachings on the nature of mind. 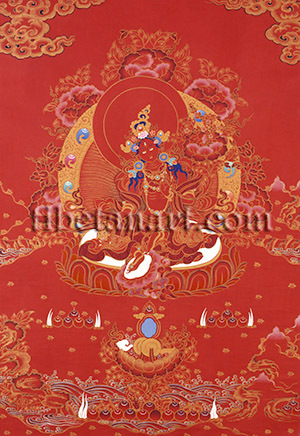 Red Tara is beautiful, peaceful and ruby-red in colour, with two arms and three eyes. She is as youthful as a sixteen-year-old, endowed with the thirty-two major and eighty minor marks, and wears the five divine silk garments and eight jewel ornaments of a sambhogakaya deity or goddess. She sits upon the moon disc of her immaculate red lotus in the relaxed posture of royal-ease (Skt. lalitasana), with her left leg drawn up, and her partially extended right foot resting on the small moon disc of a separate lotus pedestal. Her body radiates light, and her jeweled golden aura is encircled by lotus blossoms. She smiles sweetly, with her three lotus-like eyes gaze compassionately upon all beings with perfect equanimity. She wears a golden tiara adorned with divine flowers and radiant jewels, and her upper and lower garments are fashioned from embroidered red silk. Half of her sapphire-black hair is bound up into a topknot, while the other half hangs freely about her shoulders. Her crown is sealed with the small image of red Amitabha Buddha, or with Amitabha’s seed syllable, HRIH. Her right hand rests gracefully upon her knee in the boon-granting varada-mudra as she holds a golden long-life vase filled with healing nectar, which is sealed with a red utpala lotus flower. With her left hand held in front of her heart she makes the abhaya-mudra of granting refuge or dispelling fear, and with the tips of her third finger and thumb she holds the stem of an open red utpala lotus flower, which blossoms at the level of her ear. Upon this lotus stands a bow and arrow made from small red lotus flowers. The little bow is fully drawn with the arrow pointing outwards to her left.